Refer a Friend - International Giveaway - Two Winners | Sahrish Adeel - Malaysia based Pakistani Beauty & Lifestyle Blogger! 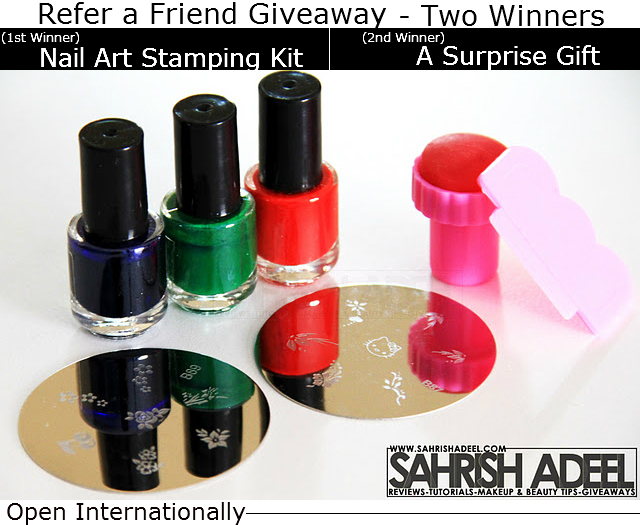 Refer a friend and win this Nail Art Stamping Kit for yourself and a Surprise Gift for your friend. Share this post on Facebook by sharing option given below this post. Bring ONLY ONE new follower to my blog. Your friend has to follow it publicly via GFC and ask her to leave a comment here writing "-(your GFC name)- sent me". You can be an old follower but referred friends should be new followers only. IMPORTANT: Your friend must write "-(your GFC name)- sent me" in comments or your entry won't be counted. First winner will be the one who will bring new follower to my blog. The winner will get Nail Art Stamping Kit. (Read review for this kit). One lucky winner will be chosen via random.org out of all the eligible participants. Second winner will be a referred follower, brought to my blog by First winner. This winner will get a surprise gift. If you are under 18 years of age, seek your parents' permission to give me your contact details if you win. This giveaway will end on 10/01/2012 and winner will be announced after that. I have a complete list of all of my previous followers, so no cheating please. I will double check everything. Winner will be announced on my blog and on my Facebook fan page. Winner will have a whole week to contact me. This giveaway is not sponsored by any company. These prizes come from my own money. If you don't understand anything, leave a comment and I will get back to you asap. I have complete right to change the rules/ending date of this giveaway. Prizes will be properly packed at the time of shipping. I will not be responsible if prize is lost or damaged. Updated: People who have privacy issues and don't want to post their email address and facebook links here, can email me at s_ba@live.com with all the details. But you still have to write your GFC name in comments and mention that you have emailed me.